A couple of years ago I learned about a special day after Halloween, when foodies make a raid on their local pumpkin patches. I set out to my local patch last Saturday to see what was left of their pumpkin inventory. Well, I couldn’t resist all these tiny beautiful pumpkins I saw in need of a home, so I packed up as many pumpkins as I could in my trunk and hauled them off in the back of my van. I guess you can say I became little obsessed with my purchase (all you can carry for 20 bucks). Since then, I have been passing out my pumpkins to my neighbors and friends who are interested in making breads or pies for the holidays. Fall’s cool weather often brings out the desire to cook up your favorite comfort foods, soups, and warm casseroles. This recipe, Pumpkin Risotto has been in my recipe box for many years, and I hope it warms up your belly like it does ours. 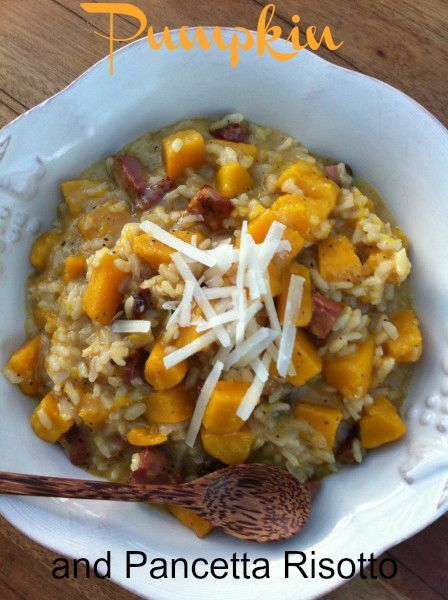 Fresh pumpkin with Italian pancetta come together in this risotto for a warm and creamy Fall dish - don't forget to add a good Parmesan cheese for extra goodness! Heat a dry skillet and fry the pancetta until browned and crisp. Heat the stock in a deep pan and set on simmer. In a large saucepan, gently saute the shallots and pumpkin in the oil for about 5 minutes. Stir in the rice and cook for 2 minutes to toast the grains. Pour in the wine and cook until reduced. Now pour in ¼ fourth of the stock and stir well. Cook gently until the liquid has been absorbed. Stir in another ladle of stock. Continue cooking and stirring, gradually adding the stock, until the rice is just tender and the risotto is creamy. It should take a total of 15 minutes. About 2 minutes before the end of the cooking time, stir in the pancetta, mascarpone, and ½ the parmesan cheese. Check for seasonings, and then serve in bowls, with the remaining cheese. Make this a vegetarian dish by substituting mushrooms and vegetable broth for the pancetta and chicken broth. Pre-cut pumpkin can be found in many stores today- Trader Joe's carry it. I always start a recipe by gathering all the ingredients in one place. Using a heavy casserole helps in the cooking process, cooking evenly is important and it prevents burning the bottom of the risotto. It takes time, so never leave the pot- keep an eye on it at all times. Pour the liquid in one ladle at a time, until thickened like this! Then continue one ladle at a time slowly until all the liquid is used-taste to make sure pumpkin and rice is soft. You may need to add more liquid and salt and pepper. My crazy obsession with pumpkins! Need one? I love how creamy and comforting this risotto looks! Jeanette, Thank you! This is my go-to dish for the Fall season. This recipe is truly one of my favorite Fall dishes. And canned pumpkin is just fine.